Many people purchase surveillance systems for their homes, apartments and condos. The installation is fairly easy, but you should still take a little time to plan where you will be installing the security DVR, where you will be mounting the security cameras, how you will be running the Siamese or plug and play cables and lastly, where you will be setting up the monitor and how you will be connecting the monitor to the DVR. Most DVRs have at least a BNC video output for a monitor or Television. Some DVRs also have a VGA video out or an HDMI out. If you are connecting the DVR to a standard monitor then you would be better off just using the VGA out since VGA will provide a better quality display. If you want to connect to a TV, it will usually be easier to connect using the BNC video out of the DVR. All you need is a standard plug and play BNC video cable or standard coax like RG59 or RG6. If you are using coax, you will need to connect the BNC connectors on the ends. If you used plug and play cables, the ends are already installed. Next, you will connect a BNC to RCA connector on the end of the cable that will be going into the TV. Now, just connect the RCA connector into the RCA input of the TV. If you need to connect multiple monitors, you may be able to use a BNC T connector to split the cable coming out of the DVR and connect a second cable to an additional TV. Sometimes, you will want to set up additional monitors to display individual cameras. These are normally called spot monitors. If the DVR doesn’t have loop outs for the individual camera inputs, it is no problem. Just use the same BNC T connectors to split the video input of any individual camera. Then connect the original coax cable into the video input but run a second cable off the BNC T and run it to the TV or monitor just like you did before. If you are running to a TV you can just use the BNC to RCA connector and connect to the RCA input of the TV. If you are connecting to a monitor with a VGA input, you will need a BNC to VGA converter. 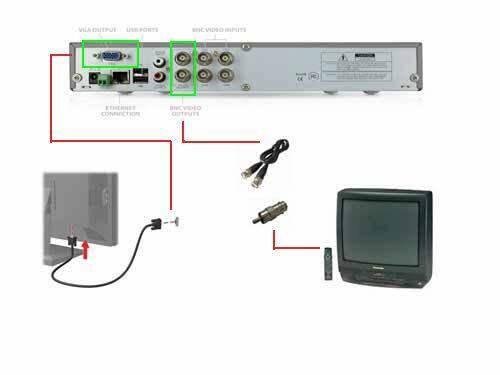 The BNC end of the cable will connect to the BNC input of the converter and then the VGA from the monitor will connect to the other end of the BNC to VGA converter.